Diseases of the aorta include a wide spectrum of acute and chronic conditions ranging from aortic aneurysms and malformations to acute aortic syndromes (AAS), including acute aortic dissection (AD), intramural haematoma (IMH), penetrating aortic ulcer (PAU) and even traumatic aortic injury (TAI). Furthermore, pseudoaneurysm, atherosclerotic and inflammatory conditions can affect the aorta at any location. High risk for acute aortic syndrome and for congenital abnormalities including coarctation of the aorta is often associated with syndromic features and hereditary genetic underpinnings. 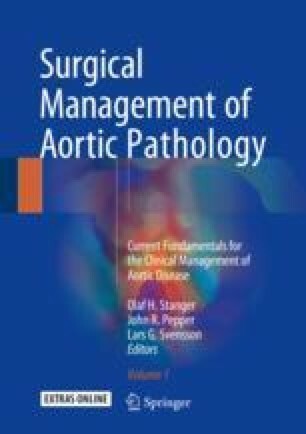 Classic surgical strategies were for many years the gold standard to treat many aortic conditions; the last two decades, however, has seen the emergence of less traumatic endovascular management as an additional or alternative option to classic surgical strategies. In particular scenarios, endovascular management has already replaced open surgery, while the complexity of the underlying vascular disease, the comorbidity and the increasing age of patients render this cohort very special. Therefore, every patient with aortic disease should be discussed by a dedicated aortic team of specialists that normally consists of vascular interventionalists (cardiology or radiology) and surgeons (cardiac or cardiothoracic) and dedicated anaesthesiologists with the idea to offer the individually best approach to a complex problem: the team should at the same time cover screening for aortic disease and follow-up after surgery or intervention at a personal level.